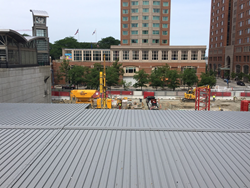 Gables Seaport, located in the Seaport District, will be a new transit oriented 23-story apartment building offering 307 distinct apartment homes and 1,370 square feet of retail in one of the most vibrant submarkets of Boston. Gables Residential (“Gables”) will develop the community in conjunction with the Drew Company and Suffolk Construction as the General Contractor. Gables Seaport is located at 501 Congress Street and holds a long-term ground lease with Massport. Located in the South Boston Waterfront, a walkable urban neighborhood within a dynamic Live-Work-Play environment, the community is just steps away from public transportation and unique dining and entertainment offerings. The area is home to major employers like pharmaceutical companies, Vertex and Intarcia, as well as financial giants State Street, John Hancock and PWC. In addition, the Boston Consulting Group, Red Hat, GE headquarters and Amazon are also present. The community is immediately adjacent to the entrance to the MBTA Silver Line with direct access to Downtown Boston and Logan International Airport as well as entrance ramps to Interstates 90 (Mass Turnpike) and 93. “This is an exciting opportunity for Gables in the Boston market to showcase the high level of quality product that Gables is known for while partnering with the Drew Company, one of the most respected developers in the city and a pioneer in the development of the South Boston Waterfront,” stated Joseph Shea, Development Director for Gables Residential. The 307 apartment homes will range in size from 469 square foot studios to 1,289 square foot two bedroom homes. Gables Seaport has also committed to having 15 affordable on-site units and has made a $5,700,000 contribution for off-site affordable housing. Design features will showcase “best in class” finishes such as stainless steel appliances, quartz countertops, under mount sinks, tile backsplashes, under cabinet lighting and LVT flooring in the kitchens and living rooms to name a few. Community amenities will include a state-of-the-art fitness center, business center, club room, game room, barbecue grills and a terrace level with a pool. In addition, Gables Seaport plans to achieve LEED Silver certification and will incorporate a number of green building and efficiency features. Being LEED Silver certified continues to establish Gables’ reputation as an environmentally conscious developer in the Greater Boston market as well as across the country. Gables Residential is an award-winning, vertically integrated, real estate company and privately held REIT specializing in the development, construction, ownership, acquisition, financing and management of multifamily and mixed-use communities. Gables Residential owns, develops and manages communities in high-growth U.S. markets such as Atlanta, Austin, Boston, Dallas, Denver, Houston, South Florida, Southern California and metropolitan Washington, D.C. Gables also provides third party management services in the New York, Baltimore, Frederick, Tampa, Phoenix, Seattle, Charlotte, Central and North Florida markets. Gables manages over 30,000 apartment homes and approximately 430,000 square feet of retail space and has received national recognition for excellence in development, construction, management, sales, marketing, learning and development, benefits and corporate accommodations. These achievements reflect the impact of our experienced and dedicated team members, our superior knowledge of the markets served, and our expertise in development and management. For 35 years, Drew Company has been boldly transforming properties, neighborhoods and the cities in which it operates with a diverse portfolio of visionary commercial, residential and mixed-use real estate projects. Headquartered in Boston, MA, Drew Company is a privately held, real estate development, management and consulting firm which oversees a broad range of ventures spanning real estate, hospitality, technology and entrepreneurial investment. Perhaps best known for its effective and collaborative approach in managing complex public-private partnerships, Drew Company has developed and operates hospitality venues, convention and exhibition centers, entertainment facilities and global trade centers worldwide. Drew Company has been involved in the development of over ten million square feet of commercial space since 1982. Among its most notable real estate ventures, Drew Company has and are developing include the Seaport World Trade Center and Hotel and in Boston, the Ronald Reagan Building and International Trade Center in D.C., Waterside Place apartments in Boston, and the Xfinity Center a concert facility in Massachusetts.